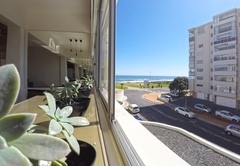 New Cumberland 205 is a property providing self catering in Mouille Point for up to 2 guests visiting the Atlantic Seaboard region. 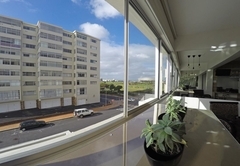 Situated on the 2nd floor, New Cumberland 205 offers accommodation in a newly renovated, modern apartment with views of the Urban Park and Atlantic Ocean. 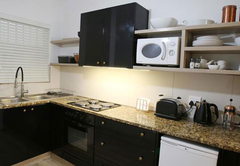 The complex has security controlled access and off street parking is provided. 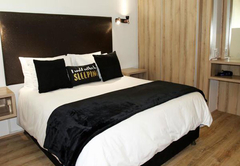 The self catering apartment has one bedroom furnished with a Queen-size bed and ample storage space. 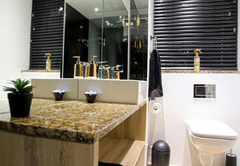 There is a spacious bathroom with a shower and complimentary bathroom amenities. 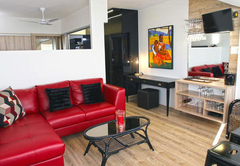 The lounge is comfortably furnished with a couch, desk and mini bar /dining table. 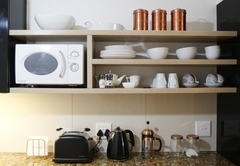 The kitchen is fully equipped for self catering and includes a stove, microwave, fridge, kettle, toaster and ironing facilities. A washing machine and tumble drier are included. The Green Point Urban Park is situated directly behind the apartment, while the Mouille Point Promenade is directly across the road in front. The promenade is perfect for walks, running and cycling. A variety of great restaurants and coffee shops can be found in the area. 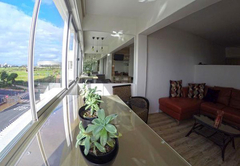 Newly renovated 1 bed apartment with Ocean & Urban park views. Clean, modern design with a sunny, spacious living room area. Comfortably furnished- queen sized bed, kitchen, washing machine, & tumble dryer. Off street parking. Free Wi-Fi. Security access. Response timeNew Cumberland 205 typically responds to requests in 5-10 minutes.